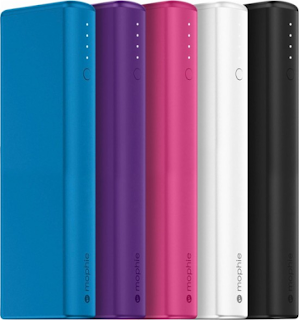 Hurry over to check out these Mophie Power Boost Portable Chargers available in 4 colors for just $19.99 (Retail $79.99)! Plus, if you buy three of these chargers, you will receive an automatic $15 deduction at checkout – no promo code needed! That means you will get 3 of these for just $14.99 shipped each! These 10,400 mAh Battery Chargers let you recharge your phone, tablet or other device while you're on the go so you can talk, text and more. It has two USB charging ports so you can charge two devices at the same time and allows for rapid charging to charge your devices fast! *Please note that not all colors are available to ship, so choose free in-store pick up (if available near you) if shipping is not available for the color of your choice.